If I am not wrong most probably you surf number of websites daily. Am I right? OK. So do you have any idea about how much popular a site is that you are using. Oh come on. I am not talking about Google, Facebook and its similar websites. These are common and everyone know about them. What for others? In this short tutorial I am going to tell you how to check any website popularity including his present world rank, country based rank, keywords that are driving traffic, main traffic sources and much more. There are numbers of online tool available to check site statistics but the problem is they need administrator access. One of them is google product named as "Google Analytics" which require site ownership to access data. One the other hand comes an amazing website - Alexa. Here I will talk about on it. Alexa is an online tool/website that provides commercial website traffic data and analytics. It was independently founded in 1996 but later acquired by amazon and still a part of it. Alexa is smart to keep record of all website stats data and interesting thing is, it is publicly available to everyone i.e anyone can check it without having site ownership. So let begin. How to Get Site Info Using Alexa? Main work starts from here. First of all copy the home page URL of website whose information you want to retrieve. Now replace "site address" with website address you copied earlier from below link. Make sure to remove "www" from URL. For example: In Below Link I am using this on Flipkart website. How to Analyse Website Traffic Data and Ranking on Alexa? 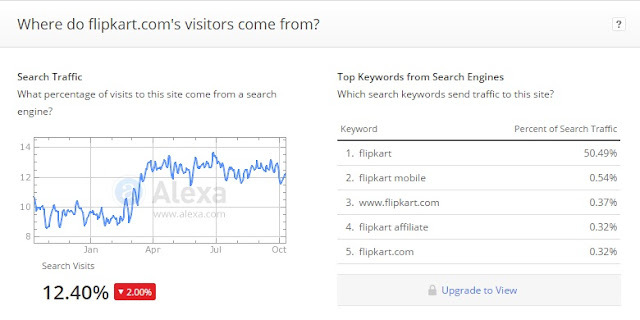 After above steps you will be moved to Alexa website page from where you can check complete analysis report. There are few important terms to keep in mind before analyzing any site popularity and ranking. All of them are listed below with their explanation and working. Global Rank and Rank in Particular Country - This rank is calculated using a combination of average daily visitors to the site and pageviews on the site over the past 3 months. For your knowledge, these ranks depends on number of factor and are not actually correct. However one can easily estimate the nearby rank. Sometimes you may find a green or red color box after rank value. This represents the rise and fall in ranking with green and red color respectively. The value under box shows how much change take place. Apart from rank values, data is represented with the help of graph. This graph is plotted between months ( along X-axis ) and rank value ( along Y-axis ) which represent the change in ranking over months. All Historical data is available only for those websites which have global rank below 100000. 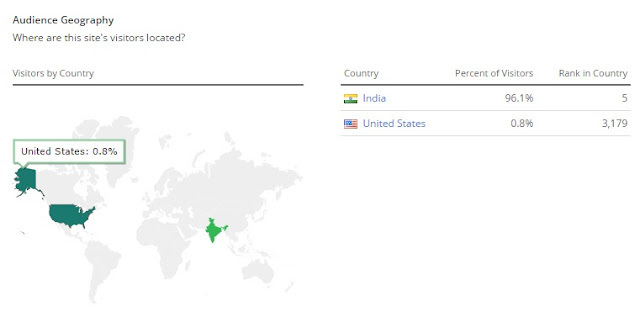 Audience geography - This data describes top countries where most of the site visitors are located. Moreover it tells about how the site is ranked in those particular countries with their percentage of visitors. World map is provided to understand it with more ease. The light green shaded area represent less number of visitors as compared to dark green shaded region. As you hover mouse to colored region, a percentage of visitors is displayed ( See below Image ). These metrics are updated on monthly basis. Using this section, one can surely estimate the approximate popularity of website and its users distribution over world. Bounce rate - It describe the percentage of visitors to the site that constitute to single pageview and is measured in percentage. Daily Pageviews per visitor - Name itself speak. 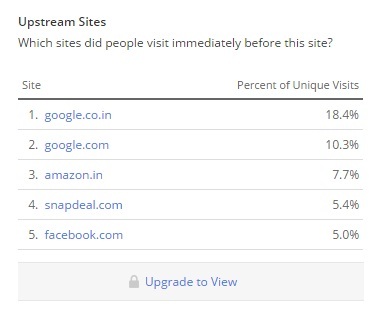 This data will show estimated daily unique pageviews per visitor on the site which is again measured in percentage. Daily time on site - It represents estimated daily time spent per visitor. The default format is (minutes:seconds). As I already mentioned, the red color box next to each value in above picture shows the down-fall in percentage. This part is most interesting which describe the main source of traffic i.e., How visitors reach that website. Generally there are 2 ways, either the visitors are from organic search ( by search engines ) or from non-organic ( including paid ads, social media etc., ). This section is generally concerned on organic search. Search traffic Data represents the percentage of pageviews that comes from search engines. Again you can make use of graph to understand down and fall in percentage over time. The graph is plotted between months ( along X-axis ) and percent ( along Y-axis). You may find red or green color box next to search visits percentage value which represents the increase and decrease in search visits. Now move to Top Keywords from Search Engines section. In short, Keywords are the word or groups of words that describe content message. Here Top keywords refers to the list of all those keywords that are driving most of the traffic. Last but not least comes an Upstream Sites which display a list of all popular websites people visit immediately before they move to site. 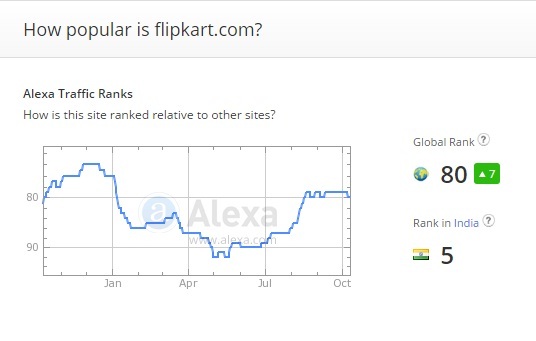 From below picture you can see Google Indian domain is the main source of traffic to flipkart website and contribute around 18.4% to it. Apart from these things, you can also find more interesting data like related sites, page load time, contact information, visitors demography etc.,. Alexa also provide toolbar or browser add-on for almost all popular browsers including Google Chrome, Firefox and Safari using which you can easily check website information in one click. 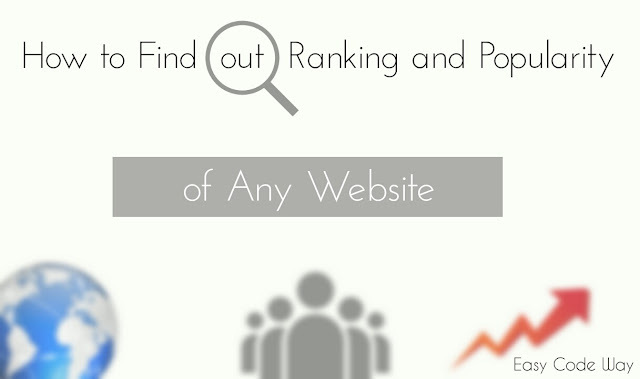 So this is all about on finding and analyzing website popularity and ranking. Isn't that interesting? Finally If you question/suggestion or know some other similar tools, please let me know and start conversation now.